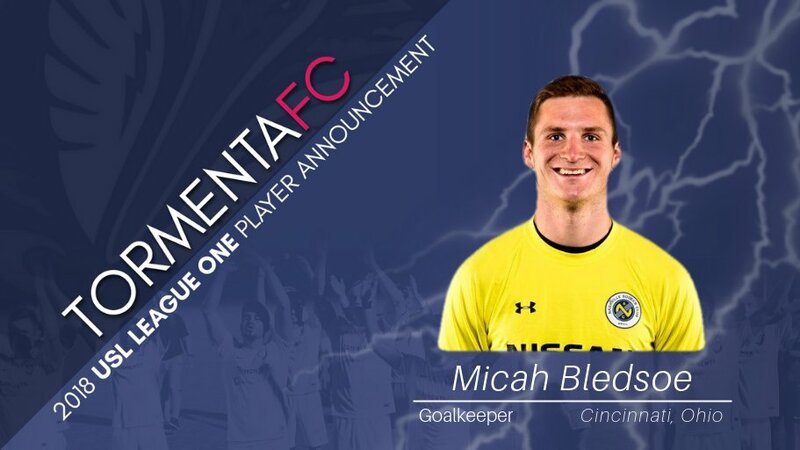 Goalkeeper Micah Bledsoe has signed with South Georgia Tormenta FC ahead of its 2019 USL League One season, pending league and federation approval. At 6-foot-5, 200 pounds, the goalkeeper previously appeared in the net for both Louisville City FC and Nashville SC, adding more professional experience to Tormenta FC’s roster. The team now has two goalkeepers on its roster, including Pablo Jara who was signed earlier this offseason. "Micah is a very talented goalkeeper who is hungry to succeed as a professional. After a stellar collegiate career, he earned the opportunity to play for two of the USL's top clubs, which brings needed experience to our locker room," Tormenta FC Head Coach John Miglarese said. "He has the frame, range, and training habits to succeed as a top goalkeeper. In signing Micah, we have secured a very strong goalkeeping core." Bledsoe attended Lipscomb University in Nashville, Tennessee, and graduated in 2017 with a double degree in accounting and financial management. During his career with the Lipscomb men’s soccer team, Bledsoe started in 51 games, had 26 wins and 15 shutouts. He appeared on the Atlantic Sun’s All-Freshman Team in 2013 and received Defensive Player of the Week honors five times. "I'm delighted to join Tormenta FC as they transition into their first year as a professional team," Bledsoe said. "There is a lot of excitement around this organization in the community, and I can’t wait to be a part of it and compete in the inaugural season of USL League One." Bledsoe is the 13th player to sign professionally with Tormenta FC. Other signees include Conner Antley, Jad Arslan, Lucas Coutinho, Charlie Dennis, Ricardo Gómez, Pablo Jara, Michael Mecham, Michael O’Sullivan, Joshua Phelps, Jerry Saint-Vil, Nick Wells, and Nil Vinyals.